From home design magazines to Pinterest dream boards, certain trends are standing out for 2014. At Surrey Marble and Granite, we pride ourselves transforming a creative vision into a practical kitchen for each of our customers. We’re always interested in seeing what exciting new ideas pop up, and this year is no exception. While some trends have been developing for several years, others seem to have arrived out of the blue. From dark granite to star-sprinkled quartz, black counter tops are a big trend in 2014. Typically paired with pale cabinets, they’re the perfect combination of stylish and practical. Sophisticated kitchen designers pick up the hue in fixtures and fittings: glossy dark stone paired with white cabinets might be finished with glossy dark steel handles. Intense, dark colours are in (think coffee, red wine or oak) but this can be a little overwhelming. Luckily for those of us who prefer a little more light, white is strong as well this season. Bold geometric combinations are particularly on-trend for floors – think a chessboard, herringbone or something more intricate. Open shelves are a great opportunity to display the things you use and love. Creating a statement shelf or set of shelves using matching or coordinating stone gives any kitchen a boost and makes even mismatched mugs look glamorous. As expert stone workers, we’ve got years of experience with stones others are just discovering. Quartz and other processed stone kitchens are stars of 2014. With so many people choosing quartz, it’s hard to guess why. We imagine that the enormous range of colours and textures and the affordable price combined with the durability and strength of natural stone is just too much too resist. Create a dramatic statement wall and a practical over-sized splash back by tiling the wall behind the stove or sink from counter tops to ceiling. Not only does this create a super-practical wipe-clean surface, it really shows off the natural beauty of stone tiles. The technique looks great around windows and less effective with overhead cabinets. This one’s a real novelty. While stone kitchen islands have grown to be the focal point in many designs, they’ve now jumped to a new level. Creating a kitchen island that’s a deliberate contrast to the granite or marble worktops in the rest of the room is a great way to create separate spaces for eating and cooking, or just to create a visual break in the space. 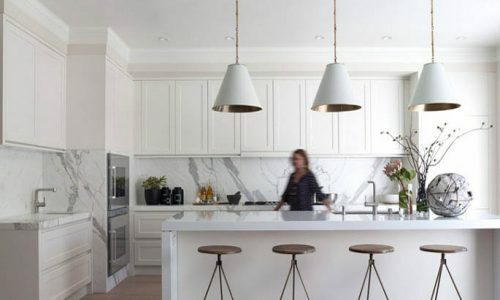 Raised and split-height islands seem to be waning in popularity, perhaps because kitchens are increasingly open plan through to other living or dining areas, reducing the need for a breakfast bar or nook. Even though here are now many kitchen worktops materials available in the market such as granite and Corian, wood is sill among the best when it comes to beauty and versatility. It can be used in traditional and even contemporary kitchen worktops. You can have wooden kitchen worktops in different colors, shapes and designs. Moreover, you can maintain and repair it easily.